AT Lavers Hill Roadhouse in the Otway Ranges, I meet Andy Cadigan, for whom the local copper is buying drinks. Which immediately piques my interest. 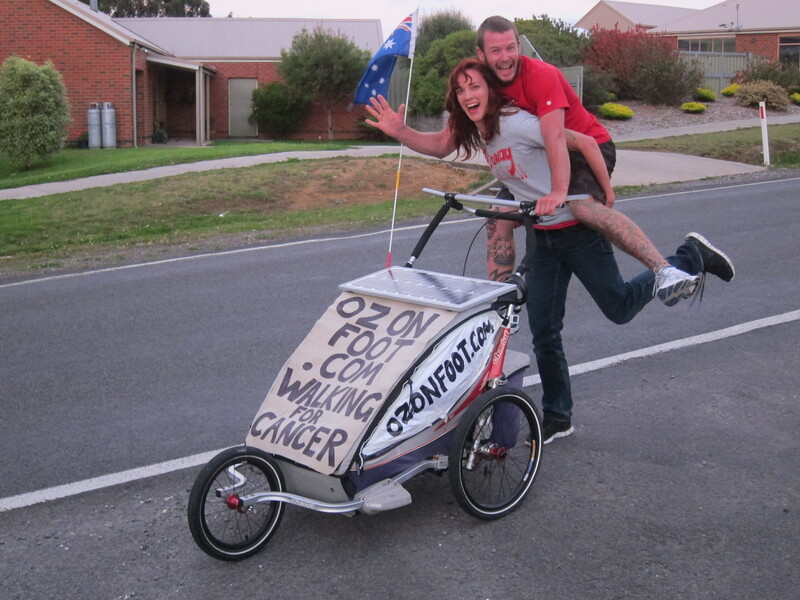 Andy set off on Boxing Day to walk around Australia to raise money for the The Cancer Council after losing his mate Simo. 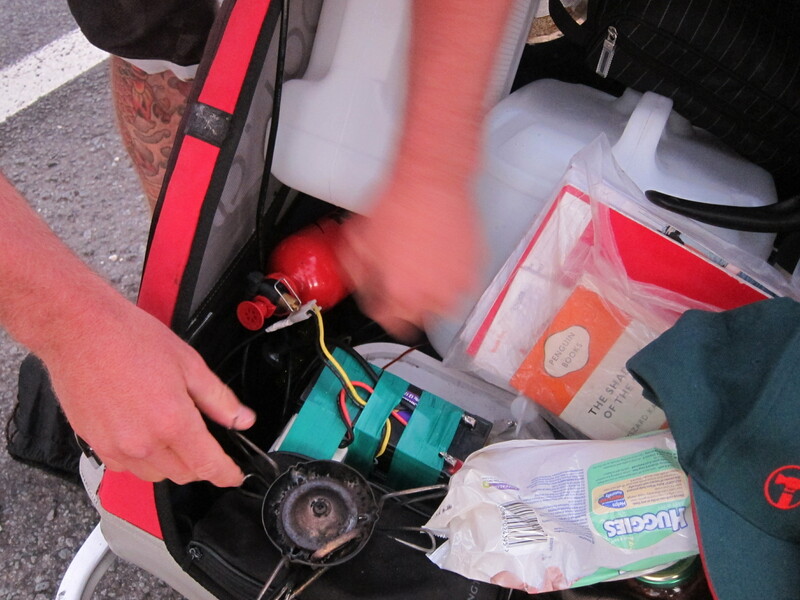 He sold his house and car to fund this trip, and all he’s got with him is a pram with solar panels that charge his laptop so he can keep people updated with his blog, Oz On Foot. Obviously Andy’s looking for donations – the monetary kind – but hearing him talk about bone marrow donations gets everyone in the pub thinking about that, too. Andy will be walking till April next year, he reckons, so I help him on his way by piggybacking him off from the roadhouse. Andy’s got a tent, a tiny cooker, water, clothes, mobile phone, laptop, sleeping-bag, wet wipes, Penguin classic… hey, that’s about it. In Tasmania, Andy got so cold he chopped the sleeves off his jumper and turned them into mittens, held on by cable ties. Keeper? We’re all knocked sideways by this bloke. Will definitely keep track of what he’s doing. 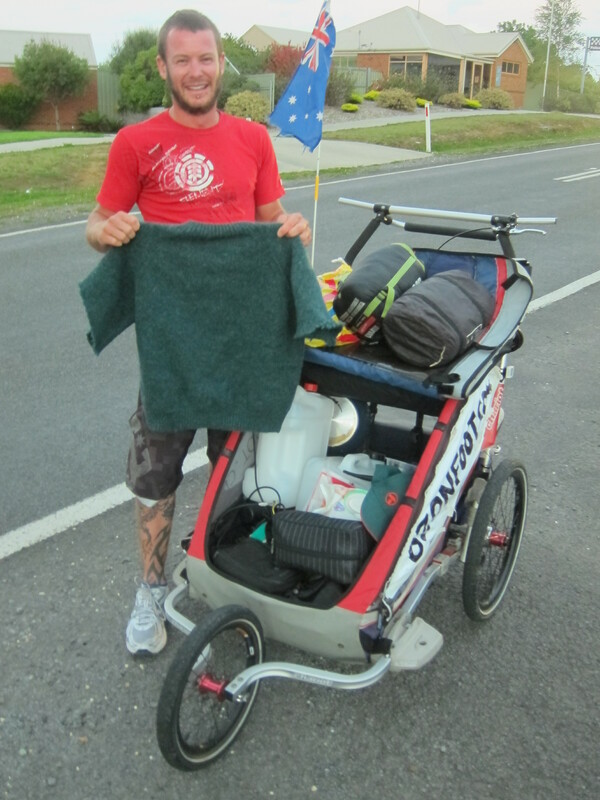 Addendum: In June 2012 Andrew Cadigan completed his epic journey of walking alone for 15,000km and raised $65,000 for charity. A month later, while recuperating in Thailand, he suffered severe head injuries in a motorcycle accident. He died in October 2012, aged 31.